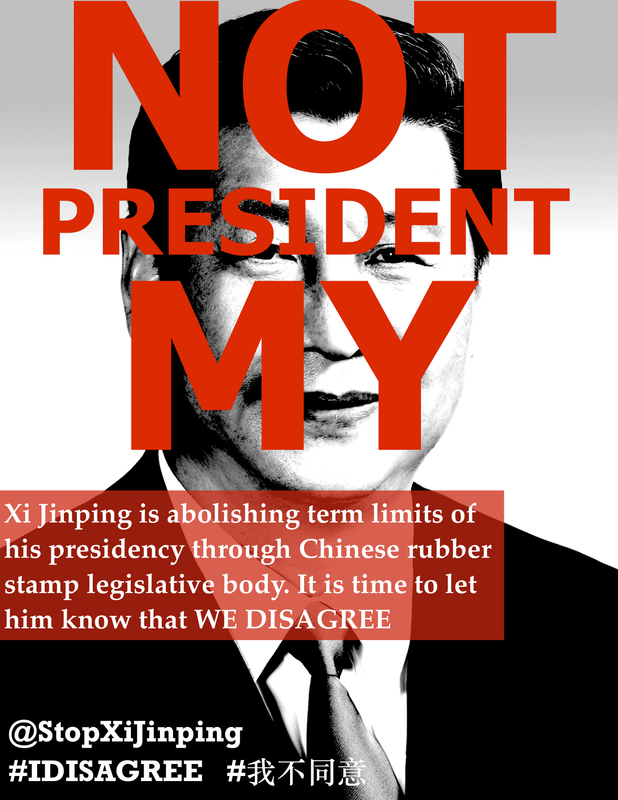 Came as no surprise, Chinese rubber-stamp legislature, the National People’s Congress (NPC) has passed the amendment to repeal the presidential term limits on March 11, 2018, almost unanimously. We never have the illusion that, given time, China will evolve into a liberal democracy. The constitutional coup d’état itself might not be as substantial either in that Xi has already consolidated his authority within the rank of ruling CPC with the grab of power and the curb on civil rights long before the amendment, rendering him able to stay as the leader of the party and the military so long as he wishes. The repeal of presidential term limit is only yet another sign of this concerning development. Many fear that an unelected strongman will plunge us into another Cultural Revolution. However, China was an underdeveloped country with little presence in the global economy back then and the chaos, suffering, and pain largely stayed behind its border. The second largest economy in the world now, China and everything happens on its soil closely interact with and impact the rest of the globe. We have stepped into uncharted waters where it is unknown that to what extent a personalist dictatorship shall abuse the power in his hands, both domestically and internationally. Many envisioned that economic development will introduce a generation willing to engage in politics and a more inclusive political system in China. Indeed, the past decades has seen a hyper economic growth and an emerging middle class, and the Chinese youth fortunate enough to benefit from the development enjoy far more opportunities than our parents. That said, the political consciousness did not follow suit. Those dare to think differently rarely speak out or get involved in collective actions out of reasonable fear of repression and retaliation, and the political cynicism is epidemic even among Chinese students overseas. This campaign has never been a petition to the rubber-stamped NPC to block the amendment. Rather, we started the campaign noticing that even the least political savvy people among our friends started to express their doubt, disapproval, and anger on social media before censored soon after. We hope that this campaign could be an opportunity to encourage people to become aware of their so far unrealized dignity as citizens. Registering dissent ideas might not deliver changes immediately. Nonetheless, we believe that by staying true to one’s convictions, one will show to himself or herself the virtue of the freedom. The support we have received exceeds our expectations. We have responses from Columbia University, London School of Economics, and University of Sydney to Chinese University of Hong Kong. The voice is heard in Asia, the Americas, Europe, and Oceania. We are those average Joes who talk about the NBA with you over coffee in the pantry or ask you where the lecturer was at during class, and we started this campaign anonymously because we have security concerns for our families at home. Like our own, we value the anonymity and the information security of those decided to join as we are well aware how much is at stake and how much trust is given to us. We are eternally grateful to our followers around the world and we are humbled by your support. We are grateful that journalists, scholars, and students who are closely watching, including Bethany Allen-Ebrahimian from Foreign Policy, Charlie Vest from UC San Diego School of Global Policy and Strategy and many others, helped us to gain exposure, we would not have garnered so much support without you. The so-called vote might be over, but the fight is still on. Let them know that we do not go gentle into the dark night, and we will, one way or another, rage against the dying of the light.